Description: Eastbounds in the afternoon at this location could be a problem for lighting, but I think I did OK on this one behind a pair of SD70Ms. Title: NEW SD70ACe on S/B Juice train at Savannah yard. Description: Waiting in the yard due to Frances. Description: Q421 rolls through Palmer with the usual loads of trash cars as other railfans look on. Description: SB (the locomotives identified are 1, 3 and 4 - I did not manage to get the number of the second one). Description: SB (the second locomotive from the lead is not listed - I did not manage to get the number). Description: Q118 eastbound at Amsterdam station. Description: West of Moberly along state hwy 24 at a private railroad crossing. Description: The 931 with CSX power trailing unit. Description: Sunnymead Rd., 0915 hours. Description: Q405 departs South Philly Yard with an interesting power lash-up consisting of only EMDs and in the back-round Q706 can be seen. Description: Q405 closes in on 58th street. Title: CSX 4716 Q405 With "CSX Employee"
Description: As Q405 exits Greenwich Yard, a man who is supposedly an employee of CSX walks across and next to the tracks. Description: It was a good chase, but I prevailed and beat Q405 to 58th street! Behind and out of view is the power of Q216. 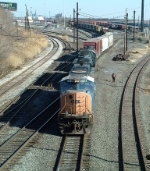 Description: SD70AC leads CSX manifest freight Q405 out of South Philly Yard around 12th Street.